On Wednesdays we are thrilled to fling open the doors to all of YOU! We love hearing your dreaming stories…the lessons you’ve learned, the roads you’ve walked, the dreams He’s planted in your hearts! Today we are excited to welcome Crystal Stine back to God-sized Dreams. She shares her superpower of cheerleading and reminds us all that as we chase the dreams our Father has given us, we are always stronger together! Today, I’m cheering for you. For the ones who chase dreams bravely even when you don’t have all the answers. For the ones who seek God, flat out and down on your face before the throne because you’ve had a glimpse of His dream for your life and you don’t know how to take the first step. I’m cheering for you, sister – you who wake up, take care of your family, put in a long day of work and carve out time in the margins to pursue your dreams. It’s not about leading or following but holding hands and walking along side, because we can’t do this without one another. 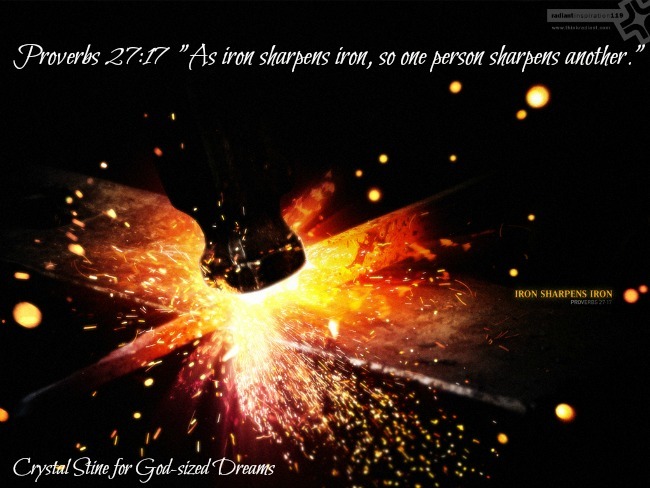 Proverbs 27:17 says “As iron sharpens iron, so one person sharpens another.” By ourselves we can check the boxes and complete the tasks, but it is community that makes us stronger, sharper, shining brighter for the Kingdom. Your courage to chase your God-sized dream gives me strength. Your passion to find time on the fringes of your day-to-day inspires me. Your faithful dedication to seek the face of the Father and His will encourage me. Your story, the lessons you’ve learned, the failures you’ve experienced, they equip me. The God-sized dream you have, the passions and talents God has given you, on the surface they might look the same as what someone else is already doing. Don’t give up. Your dream is uniquely yours to chase. (<====Tweet this.) We need your voice, your creativity, your version of your dream that God knew could only come from you. So today, I cheer for you. I pray for you. I stand beside you knowing that somewhere along this God-sized dream journey I’ll need you to hold my hand – and sometimes even hold my arms up high when I feel like I can’t possibly go on. And as we journey together we’ll forget if you’re helping me or I’m helping you and we’ll realize that we’re simply stronger, together. Crystal Stine is a toddler-wrangling, coffee & chocolate loving, full-time working mama married to her high-school sweetheart. She is passionate about living authentically in the beautiful, messy, unfinished parts of life. It’s through the eyes of her daughter that Crystal has learned what it’s like to love fully, forgive completely, and encourage daily, which she does as the Editorial & Marketing Manager at(in)courage and at her blog, crystalstine.me. You can connect with her on Twitter at @CrystalStine and learn more about the communities & events she’s involved in here. I love this line: “And as we journey together we’ll forget if you’re helping me or I’m helping you and we’ll realize that we’re simply stronger, together.” Thank you for such an encouraging post, Chrystal! I can almost see you waving pom poms! Beautiful! I’m starting on my dream(well, one of them). I got with one of our pastors yesterday and left feeling energized, excited, and afraid. Is this HAPPENING?!?! Oh wow. I felt like I was given a blank canvas and told, “We trust you to come up with something worthwhile. We’ve been waiting for you. Go.” My prayer is that I don’t mess it up! That I bring glory to God! That I stay grounded with heaven in view while letting the Spirit of Christ live in and radiate out of me! Dreams…wow. I love this, Crystal! I have heard so much through the spoken and written word and the whispered voice of God about not neglecting the gifts we are given. This post drives that principle home. Thanks for being such a faithful cheerleader!